Apotheosis: from Late Latin apotheosis “deification,” from Greek apotheosis, from apotheoun “deify, make (someone) a god,” from apo- special use of this prefix, meaning, here, “change” + theos “god” (see theo-). In his book, The Hero With A Thousand Faces, Joseph Campbell writes that the Hero must pass through a stage of Apotheosis. According to Campbell, apotheosis is the expansion of consciousness that the hero experiences after defeating his foe. 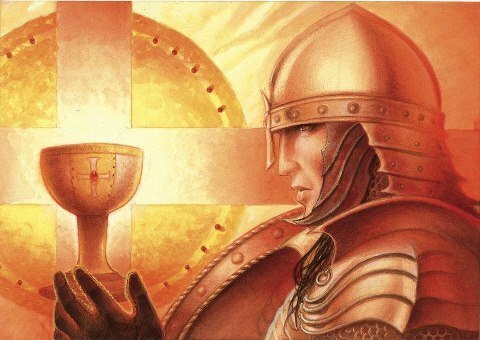 To continue using the Grail as a metaphor for the Soul, as it was given to me in the dream that I recounted in my post, “The Quest for the Holy Grail”, to drink from the Grail would be to heal the divide between one’s ego and one’s Soul. To be languishing in the wasteland is to be separated from one’s divinity; to drink from the Grail is to experience the divinity of one’s Soul. To be healed would be to put aside the inauthentic life one was living and to embark upon the true purpose of one’s Soul. How does this divide between the ego and the soul arise? Presumably it could arise from a variety of causes, but perhaps the spilt is engendered by the very foe that must be defeated. In my case, which is likely not that unusual, it arose from the treatment I received from my father. The inherent abilities I possessed, my interests, my values, and areas in which I lacked ability, these were all constantly disparaged. This degrading treatment caused an internal estrangement of me from my own higher self. I disowned and discounted what was devalued by those around me. Over the years I have sought healing for this in many forms, with varying success. Recently, another person has entered one sphere of my life whose attitude toward life and whose treatment of me is remarkably similar to that of my father’s. Though it is painful to experience being treated in such a demeaning fashion again, this time around it also easier to not take it personally as one unavoidably does as a child. And it is also easy to see the pain that this man carries that causes him to approach life as he does. Rather than causing me to become angry, he elicits sympathy. Rather than causing me to divorce my own self, he gives me an opportunity to dive in more deeply to maintain my center. Campbell also writes that an integral part of the apotheosis process is to achieve atonement with the father. So it is clear that this troubled person who has entered my life is a purposeful part of my present quest to connect more fully to my Soul and to live out my Soul’s purpose. Through my encounter with him I can heal the old wounds from my father, reconcile the estrangement from my Soul, and thus experience apotheosis. May it be that I drink deeply from the Holy Grail. This entry was posted in Metaphors, Quest of the Knight-Errant, Zenith Arc and tagged Apotheosis, Atonement with the Father, Grail, Hero's Journey, Holy Grail, Joseph Campbell, The Hero With a Thousand Faces. Bookmark the permalink. Wonderful! I will look into this. Thank you!